A high-value basket for a high-value relationship. 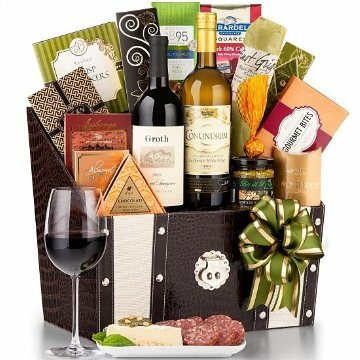 This brand new luxury gift brings together 90-point rated wines, a trove gourmet delicacies, and a sophisticated keepsake container you'll find only at GiftTree - altogether a luxury presentation designed to impress those who appreciate the finer things. The two bottles of wine have been chosen for their outstanding reputation among those who know and their refined presentation in coordination with the Madison Avenue's overall design. Both appellations are nationally acclaimed for bringing superior quality while the Groth Cabernet has earned the hard-to-get rating of 93 points from Wine Enthusiast magazine. This basket includes the following: Auberge Brie Cheese Spread 3.75 oz, Cheese Spreader, Aaron Bell Crackers 3 oz, Candy Pebbles 4 oz, Chianti Wine Salami 8 oz, Basil Pesto 6.3 oz, Aaron Bell Almonds 1.5 oz, Seasoned Snack Mix 4 oz, Dolcetto Tiramisu Wafers 3 oz, Licorice Salmiak 4 oz, Almond Roca .82 oz, Biscotti 1.62 oz, Gourmet Coffee Blend 1.5, Mango Jelly Beans 4 oz, Fruit Pastilles 5 oz, Pecan Nougat Caramels 1 oz. Conundrum 2011 White Blend: Winemaker's Notes: "This unique, non-traditional white wine blend was created to offer full-flavored fruit and enough complexity to match the creative dishes being offered by today's generation of chefs. Conundrum can be served with every course from appetizer to dessert and pairs beautifully with spicy foods and full-flavored Asian cuisine..."
If any substitutions are necessary, they will be made with items of equal or greater value. Measures 14" x 8.5" x 18". Please note that this gift is only available for purchase and receipt by persons over 21 years of age.